Sherwin Prior is the co-founder and managing partner of Blue Victor Capital, LLC. He has twenty years of experience as a finance and investment professional. Prior to Blue Victor Capital, LLC he served as the managing director of GM Ventures LLC, the corporate venture capital arm of General Motors where he managed a six-person team and over $250 million in assets. In 2017, Sherwin was ranked #14 in the Global Corporate Venturing Rising Stars publication. He also served as a senior executive leader of the General Motors African Ancestry Network, an Employee Resource Group. In 2018, Sherwin was recognized as one of the Most Influential Blacks in Corporate America by SAVOY magazine. Sherwin’s investment experience also includes work as a buy-side analyst on the growth equity platform at NorthPointe Capital, LLC. He has also worked for Morgan Stanley Investment Management in New York as a Senior Associate where he was responsible for investments in the industrials and consumer discretionary sectors of the economy. Additional experience includes JP Morgan Chase where he was a Commercial Credit Analyst in the Asset-Based Lending Group; and Stout Risius Ross Valuation Consultants in Farmington Hills, Michigan where he was responsible for appraising middle-market companies and real estate. A veteran of the U.S. Army, Sherwin received a bachelor’s of business administration degree in finance from Eastern Michigan University, where he has also served as an adjunct lecturer of Finance. He earned a Master of Business Administration from the University of Michigan. 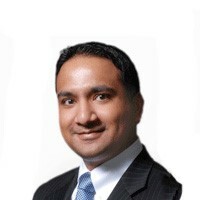 Anish started his career at General Motors (GM) in Corporate Risk Management then rotated to Corporate Strategy working on a variety of strategic product development related initiatives. In his last four years at GM, Anish was an Investment Manager at GM Ventures, responsible for 10 direct investments in transportation related startups with in-vehicle applications. In 2014, he left GM to help Shanghai Automotive Industrial Corporation (SAIC) open its venture capital office in Menlo Park, California. As Senior Investment Director at SAIC Capital he was responsible for building the venture team and 10 direct investments in transportation focused startups. Currently Anish is Co-Founder and General Partner at Blue Victor Capital with a focus on mobility/transportation startups.